What is Health Psychology? Health psychology focuses on how our biology, social context and psychological states influence health and illness. The traditional view of health is that the mind and body are separate entities. However, we now know from scientific studies that the mind and body are intimately connected (i.e., via neurochemistry) and that changes in physical health can influence mental and emotional health (and vice versa). The nature of our relationships with others also can affect our overall health. By examining how these factors influence each other, we can develop ways to improve our physical and psychological health and well-being. 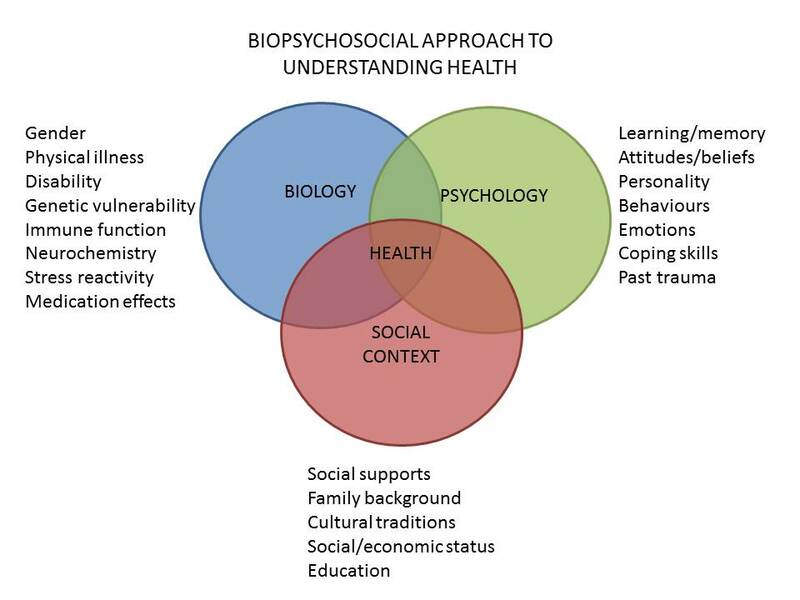 This is known as the biopsychosocial approach to understanding health and well-being (see diagram to the left). Not following medical recommendations. For instance, depressed patients are three times more likely not to follow medical treatment recommendations compared with non-depressed patients . Thus, to optimize overall health, it is necessary to address the health and wellness of mind, body, and spirit, rather than to focus solely on the physical components of health. This view consistent with the World Health Organization's definition of health, that it is a "state of complete physical, mental and social well-being and not merely the absence of disease or infirmity." Health Promotion. Psychology services are available to assist individuals who may be at risk for developing a more serious health issue due to their lifestyle habits, such as poor diet, sedentary lifestyle, work/life imbalance, or lack of stress reduction skills. Chronic Pain. Chronic pain is a persistent daily stressor that can change one's ability to participate in valued daily activities, such as work, leisure and social activities. As a result, people with chronic pain often report experiencing changes in mood (anger, frustration, low mood, fear), poor sleep, increased stress, increased muscle tension, strained personal relationships, and feelings of helplessness. These changes can worsen the overall pain experience and pain-related suffering. Cardiac Psychology. Learning to live with a heart condition can be challenging as it can affect many aspects of one's life. Patients may have concerns about undergoing treatment, taking new medications, and making heart-healthy lifestyle changes, such as increasing physical activity, making dietary changes, moderating alcohol use, quitting smoking and managing stress. Other areas of concern include changes in mood (feeling shocked, confused, overwhelmed, angry, sad/blue, fearful), worry about health, worry about dying, and changes in personal relationships. Adjusting to a New Medical Diagnosis. Receiving a new and major medical diagnosis such as a heart attack, cancer, or organ failure can be difficult emotionally and bring forth powerful feelings such as a sense of loss, shock, confusion, disbelief, anger, fear, and sadness. Making sense of these feelings and life changes and trying re-establish a new normal way of being can be a challenging process. Many also find it difficult to relate to others during this period of adjustment.